'Conscience' of Syrian Revolution Faces Challenge from Islamists Every Friday, protesters in Kafr Nabl, a small town in northwest Syria, take to the streets with posters offering their witty and sarcastic take on the state of the uprising. The town is attracting young Syrians from all over the country who are calling for a secular, democratic state. Protesters in Kafr Nabl have become famous in Syria for their posters criticizing the government. Here they pose for a photo that will instantly be posted on Facebook, in front of a building that was shelled by government forces. Kafr Nabl is surrounded by rocky hills covered with olive and fig trees. 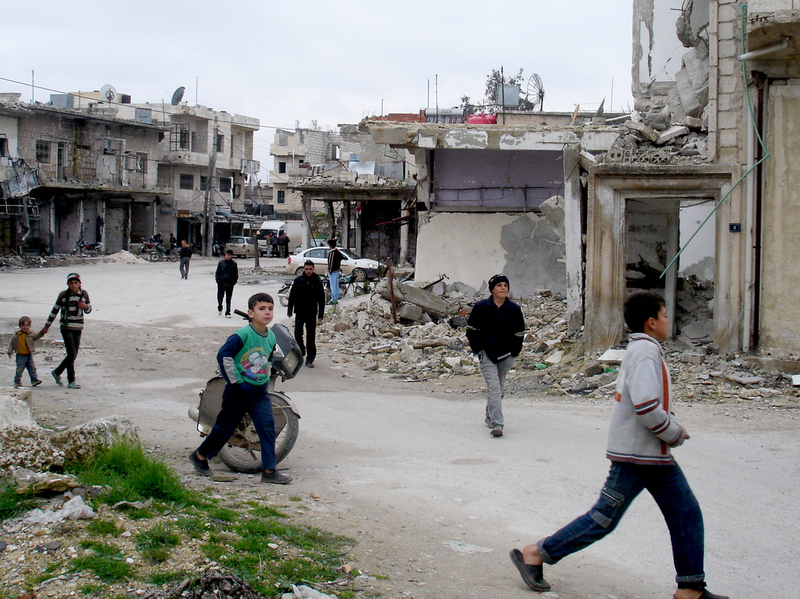 Located in northwest Syria near the Turkish border, it used to be a sleepy town of about 30,000 people. Then it rose up against the government in early 2011. More than a year later, the town was "liberated" by anti-government rebels who forced out soldiers and police who worked for the government. But the fighting didn't stop there. Government forces still stationed on a nearby base began punishing the town with mortars, artillery and the occasional airstrike. Dozens of people died each month, and now a large percentage of the people in the town have fled to Turkey. Kafr Nabl means "garden of the nobles." To say Kafr Nabl is beautiful would be wrong, though. One person told us it's beautiful on the inside. To look out over the town now is to see empty houses and houses that have been destroyed by government forces. But it's not Kafr Nabl's looks that have made it so famous. It's the fact that Kafr Nabl has something to say. It's been called the "conscience of the revolution." Every Friday, protesters take to the streets of Kafr Nabl, holding handmade posters with clever, sarcastic messages. At one point, pictures from Kafr Nabl began spreading on Facebook. Now they've gone viral. Early on the messages were directed at the Syrian government: "Stop killing us with your tanks." Then they were directed at the international community: "Let us die, but do not lie." The art is even more biting. President Obama waltzing with Syrian President Bashar Assad. References to a Pink Floyd album with Syria on the dark side of the moon. And a fictional game show called "Terrorists' Got Talent" showing Assad killing innocent people. The town is now so well known that young urbane Syrians are flocking to the place, setting up shop in a rural backwater they'd never even heard of before the uprising. "Kafr Nabl is one of the very few [places] that works on expressing itself very clearly," says activist Maya Mesh. "Actually, I wrote several times on Facebook that I'm in love with Kafr Nabl, long before I came to Kafr Nabl." 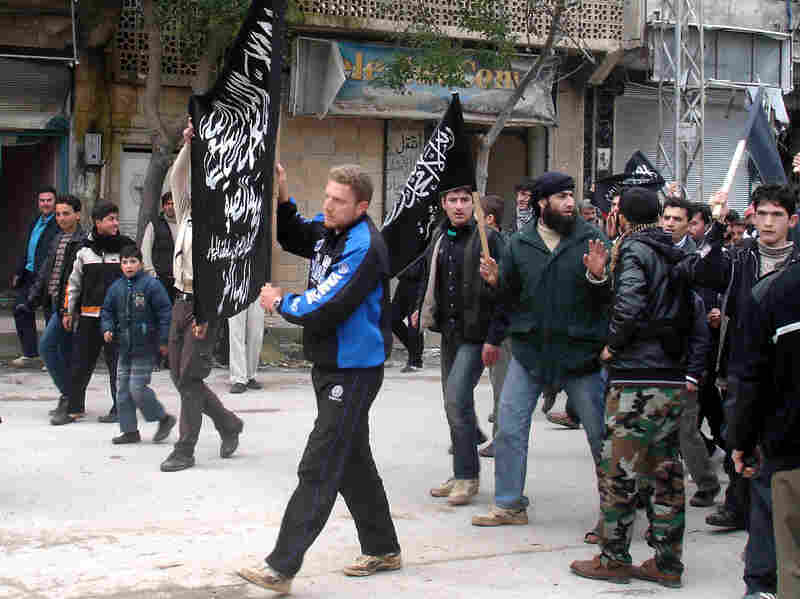 Islamists from Jabhat al Nusra stage their own protest in the town. Until recently, the group has been reluctant to appear in public. Mesh and some local activists have started a program to bring projectors into schools where displaced families live and show music videos and cartoons to kids. Mesh's own family has no idea she's here. She says they'd worry too much about the government shelling that continues even now. But she says, that's better than trying to work in Syria's capital, her hometown, where activists like her are detained, tortured and sometimes killed. "I'm OK with shelling but not detention," says Mesh. "That's why I'm here, not in Damascus... [where there are] raids and detention and you can't work freely. But here's it's just fine. You just die, that's it. It's fine." Mesh and the activists of Kafr Nabl usually gather in a room in an abandoned house that's become the unofficial media center in town. Carpets cover the concrete floor; everyone sits on thin mattresses. Young boys rush to Kafr Nabl's main square for the weekly Friday protest. It's late on a Thursday night. The weekly demonstration is the next day. It's time to make the posters. The brain behind Kafr Nabl is a bawdy, middle-aged guy with dark blue eyes and an impressive nose named Raed Fares. His favorite word these days is pimp [arsa in Arabic]. He uses it on friends and enemies. At the moment, Fares is stressed. He just got back from a meeting with Jabhat al Nusra, the hardline Islamist group that's also fighting to bring down the Syrian government. While the secular activists and the Islamists share the same goal now, Fares and his friends worry what the Islamists will do later. The Islamists have told Fares they'll stage their own demonstration the next day. Fares begged them to hold just one unified demonstration, but they refused. Fares stares at his laptop for what seems like a long time. Then, a slogan emerges: "World! 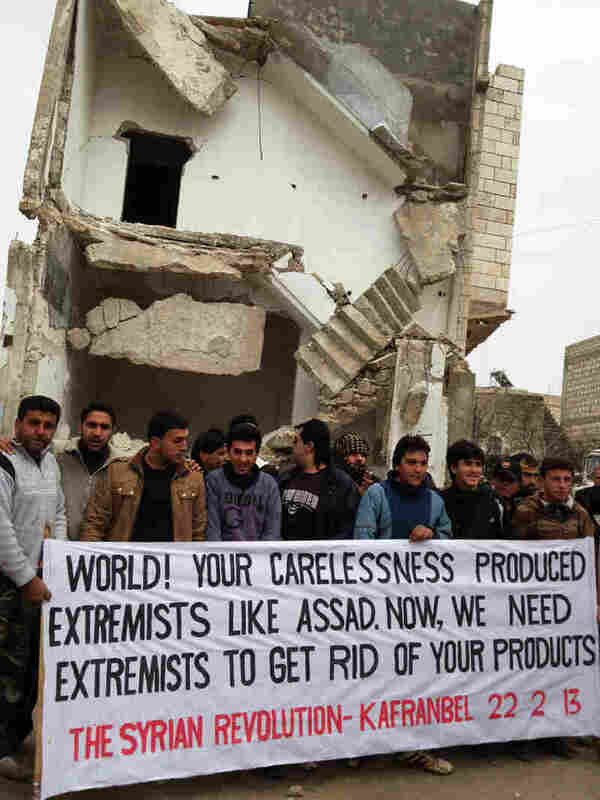 Your carelessness produced extremists like Assad. Now we need extremists to get rid of your products." The wording might be a little awkward. But the meaning is clear. The world's refusal to intervene and stop the killing of civilians in Syria has only made Syria's president, Bashar al Assad, stronger. Now the only way to defeat him is with the help of extremist fighters. The Arabic slogan is a little less provocative: "We are the squares of freedom, under the skies of the country, and everyone is welcome." Fares uses a ruler to draw the lines on a massive white cotton banner, then gets to work with his paintbrush. The next day is Friday. About a 150 guys flock to the town's main square, where shelling by government forces has reduced many buildings to rubble. The posters are unveiled. Everyone poses for the requisite Facebook photo. Then the Islamists show up. They've got about 300 people who carry black flags and sport long beards. "The people want an Islamic caliphate!" they chant. Fares' group responds. "The people want a secular state!" Some demonstrators try to find slogans that will satisfy both sides. But eventually the Islamists decided to march away from the square. Hundreds of people follow. Fares and his friends are clearly defeated. "I am not fine," he says. "Kafr Nabl is now two halves." Still, by the time the Islamists have made the rounds through town and come back to the square, their numbers have already dwindled. In the end, they're not so strong.